Indian Army Official website or www.indianarmy.nic.in for the post Territorial Army Officer. Candidates who are qualified Graduation they are eligible for applying this TA Officer Jobs. 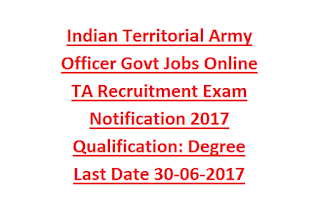 It is mandatory to apply online for this Officer Jobs of Territorial Army. Selection for this TA Officer jobs will be based on Objective type written exam, physical tests, Interview, SSB Tests/Interview and Medical Examination. Candidates must have clear the written exam to attend the interview. Online applications are available from 01-June-2017 to 30-June-2017. Completed details of Territorial Army Officer Jobs recruitment 2017 exam pattern, selection procedure and SSB Interview and more information is given below. Number of vacancy details will be announced after completion of recruitment process. You know already that is Indian Army having plenty of opportunities. Candidate's age limits are should be in between 18-42 Years. Selection for this TA Officer Jobs will be based on Written Exam followed by Interview and SSB Tests/Interview. Written Exam consists of two papers. Paper 1 will be conducted on morning session and paper 2 will be on afternoon session. Both the papers are objective type only. Exam will be OMR Based and negative marking for each wrong answer. For each paper candidate must have secured 40% and average 50% from both the papers. Each paper will be conducted for 2 hours. 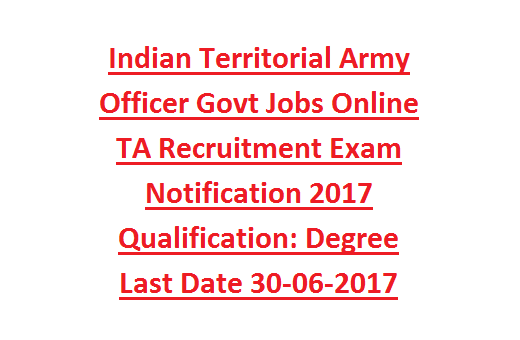 Candidates have to apply online for this TA Officer jobs through Indian Army official website of www.indianarmy.nic.in and then read the instructions for filling online application form (IAF(TA)-9 Revised Part-1) has been given in the website. Last date for submission of application form online is 30-06-2017.